Today’s the day for the built-in banquette tutorial. I’ve been putting off writing this, because these types of posts end up being a monster to write. But, I can’t put it off any longer. =) Also, I just announced last night on Instagram that we put the Highland Cow in a shop on Society6. You can now buy prints and pillow covers. We are pretty excited. 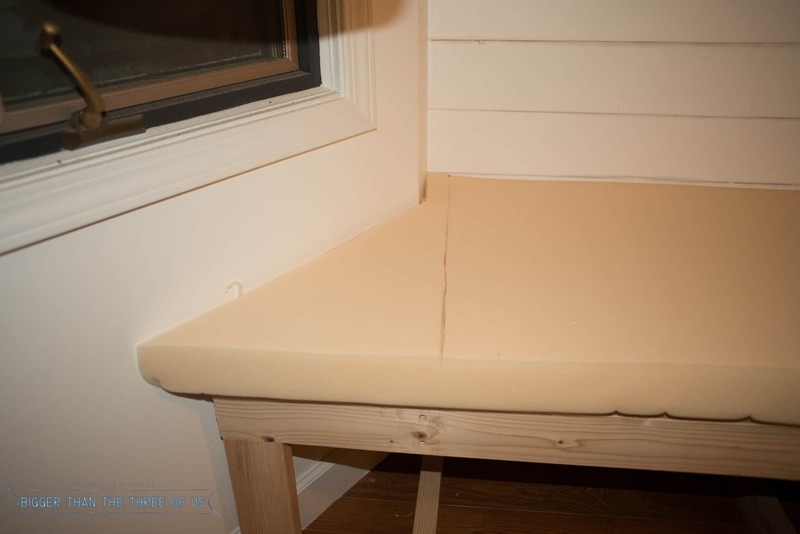 Anyways, let’s get back to the DIY banquette with back (which we are using the wall as the back support). *Visit our shop on Society6 to purchase the Highland Cow art. This was a simple build and really could be accomplished over the course of two weekends. We drug it on (like usual) but if you really go on it.. then you could definitely have it completed over the course of the two weekends. As far as price goes, I kept some receipts but not all of them. Oops. We actually used some scrap wood for parts of the frame, which you will see in just a bit. So, if you had a bit of scrap wood sitting around… then I think this build would come in around $120 or so. The padding, foam and fabric came to around $100. So, in total, this project came in right around $220. In all projects like this, you have to consider how big of a space you are working in. 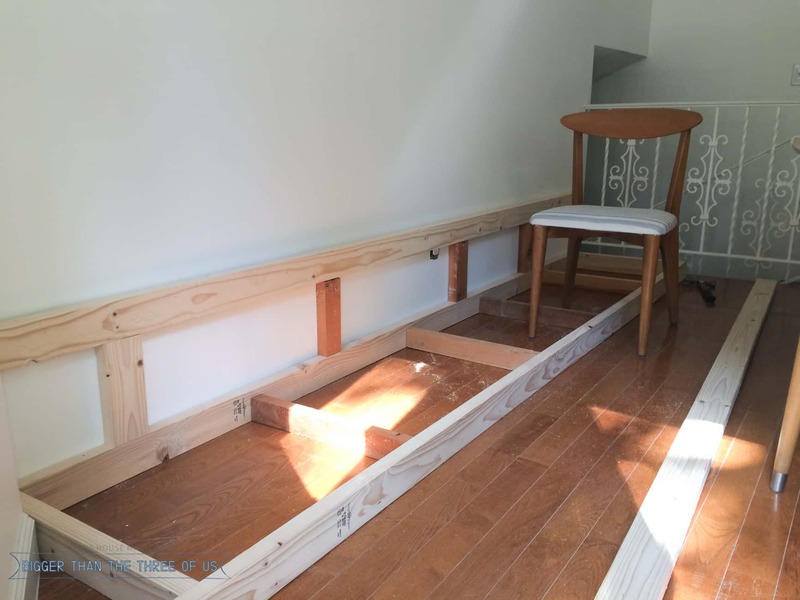 Our DIY banquette ended up spanning the whole open space on our wall, which was just over 10 feet. If you had a smaller area, then of course, you’re price would go drastically down. Just something to keep in mind. *Affiliate links listed below. Click here to read my full disclosure. NOTE: These measurements are what worked for our kitchen. Sizes will vary. Measure your wall. 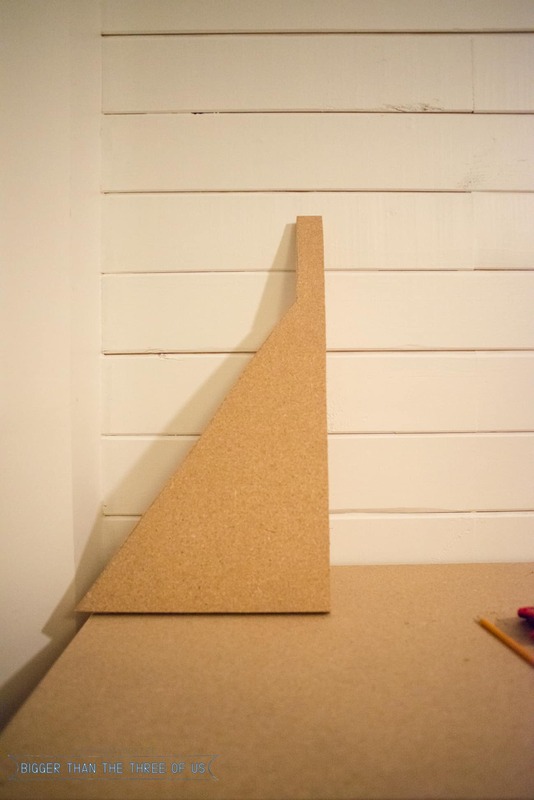 If you do not have a bump out or any irregularities, then cut (4) 2×4’s to 1 inch shorter than your wall length. 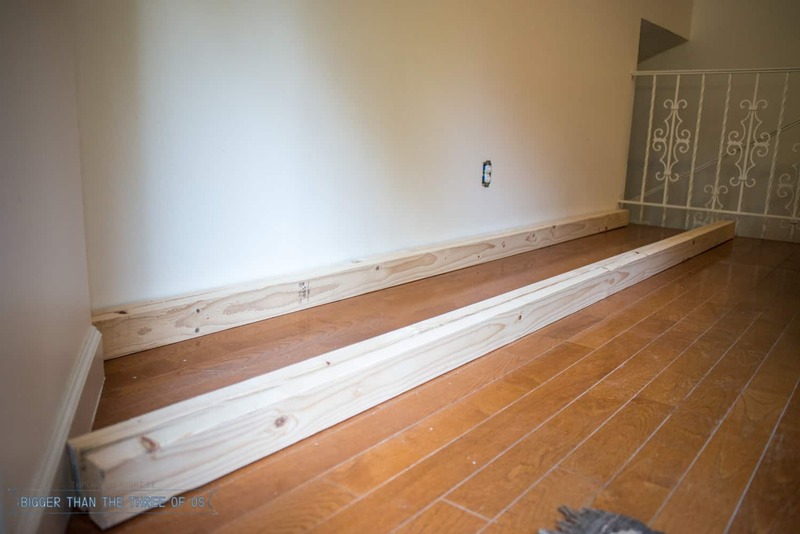 *We have a bump out so our back pieces (2) were cut to 123 (1 inch shorter than our wall of 124 inches) and our front 2 pieces were cut to 133.5 inches (about one foot shorter than the front span of the area). 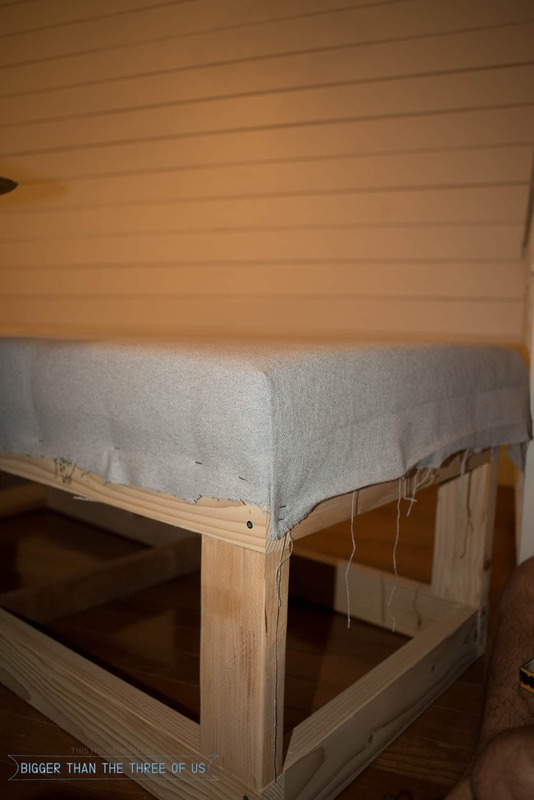 First things first, decide what height you want your bench to be and make sure to account for wood and foam. 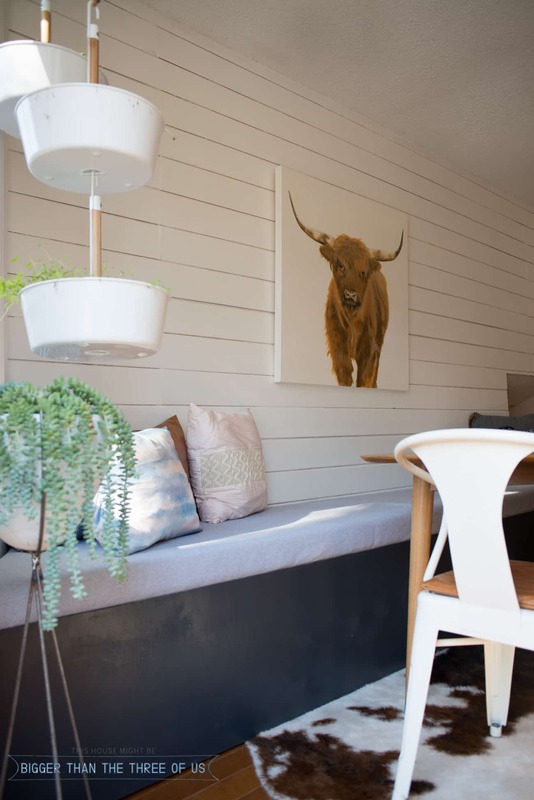 If you have a table and chairs and like the chair height (our chairs were 18.5 inches) then take the chair height and use that height to start with. Our measurements were: 2×4 (actually 3.5 inches) + 9.5 inches (2×4 supports) + 2×4 (3.5 inches) + 3/4 inch particle board + Batting + 3 inch foam. Our bench height ended up being 20.5 inches. 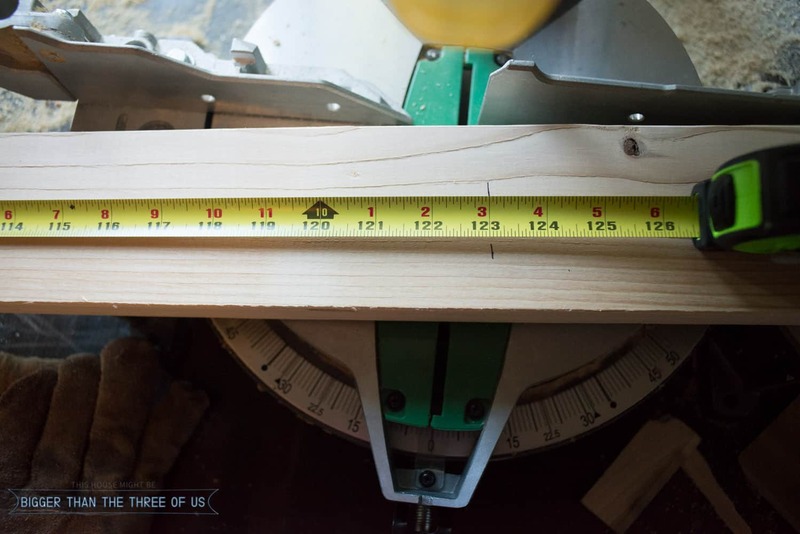 We cut 12 (six for the front and six for the back) 2×4 supports at 9.5 inches. We cut 6 floor supports at 20.5 inches. Attach your floor supports first. 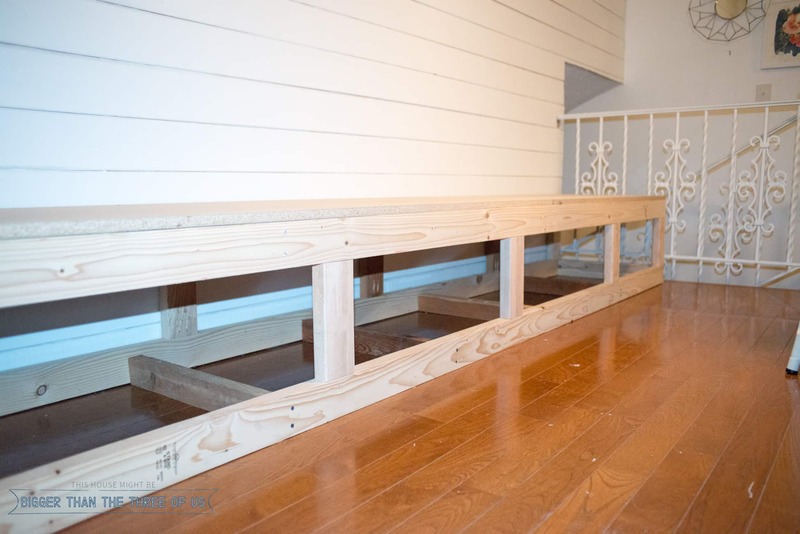 You can drill in from the long 2×4’s on each side to make this easy. We eye-balled the spacing. 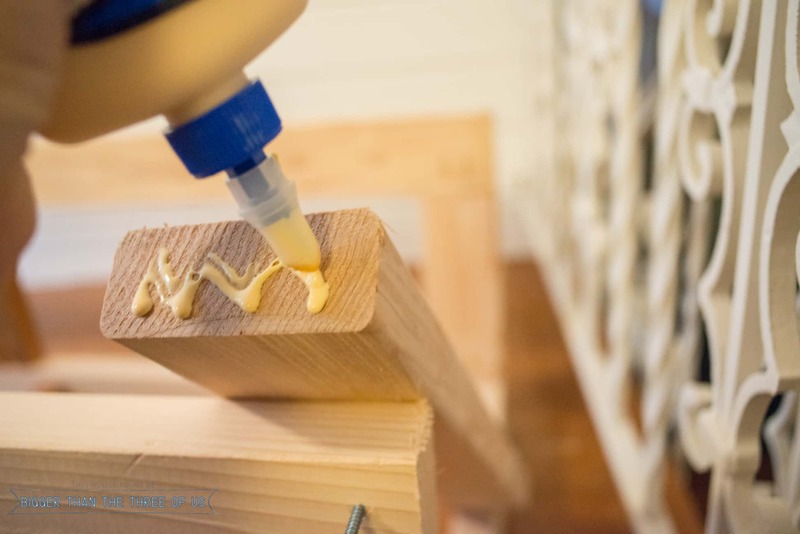 On each of your upright supports, use the Kreg jig to make holes to attach the screws on the support to the bottom 2×4. It’s also good to use wood glue on these because the slanted screws (from the Kreg jig are not as strong as vertical screws would be). See below. On the 2×4’s that span the wall, mark where your upright 2×4’s hit and use the Kreg jig and wood glue again to attach the 2×4’s together. 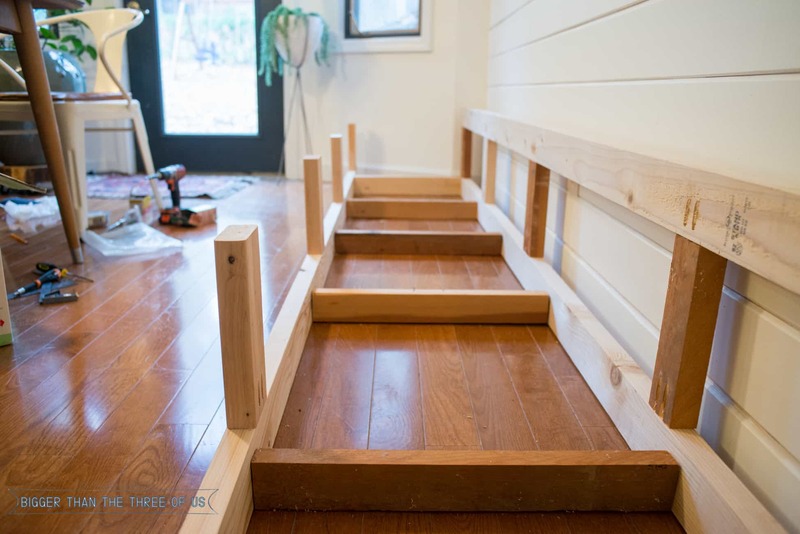 Once you’ve attached the bottom 2×4 to the upright supports and then the top 2×4, this step is completed. Cut 6 more 2×4 supports at 20.5 inches. Attach with Kreg jig and wood glue. Screw into the supports from the outside on both sides. Again, we eye-balled the placement but it was very similar to the flooring supports. Most hardware stores will cut wood for you. We measured for the top (it was 24 inches by 167) and had the particle board piece cut in-store. Attach by drilling wood screws down into the frame. Once the top piece was on, we still had to troubleshoot the bump out piece. Luke made a cardboard template of the space and then used a jig saw to cut it out of the particle board. We placed a few screws in the particle board to attach it firmly to the 2×4 frame. 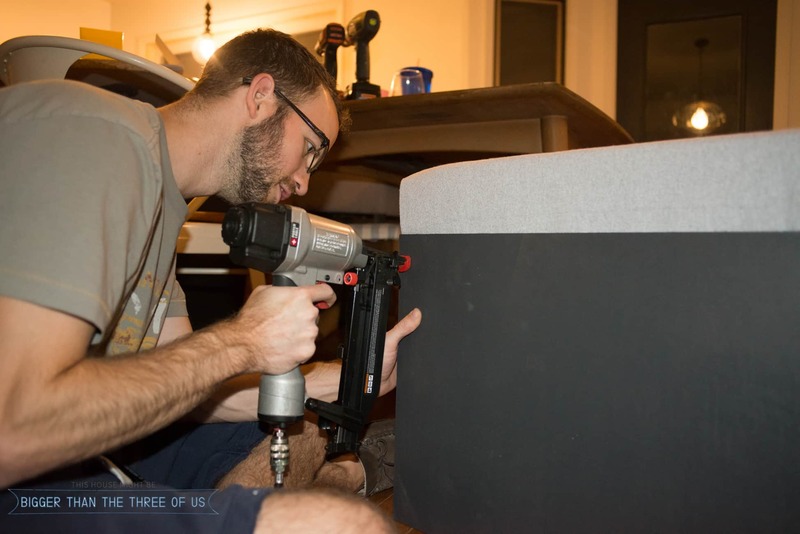 We placed the foam down first and then used the cardboard template from step 7 to get the foam piece for the bump-out. Lay the batting over the foam and staple. Trim up any excess batting. 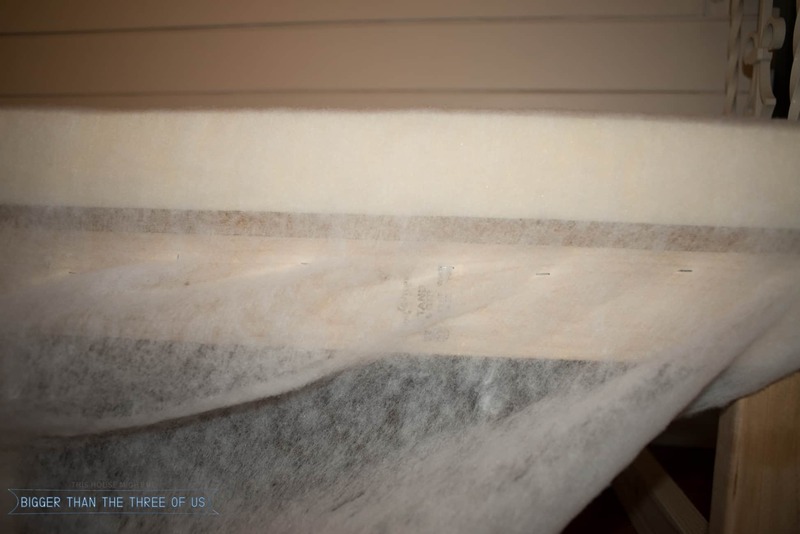 Lay the fabric over the batting and staple (making sure to pull tightly as you go along). Using 1/4 inch plywood, cut it to size for the front and side panel. Prime and paint. Attach to the front and sides with a nail gun. 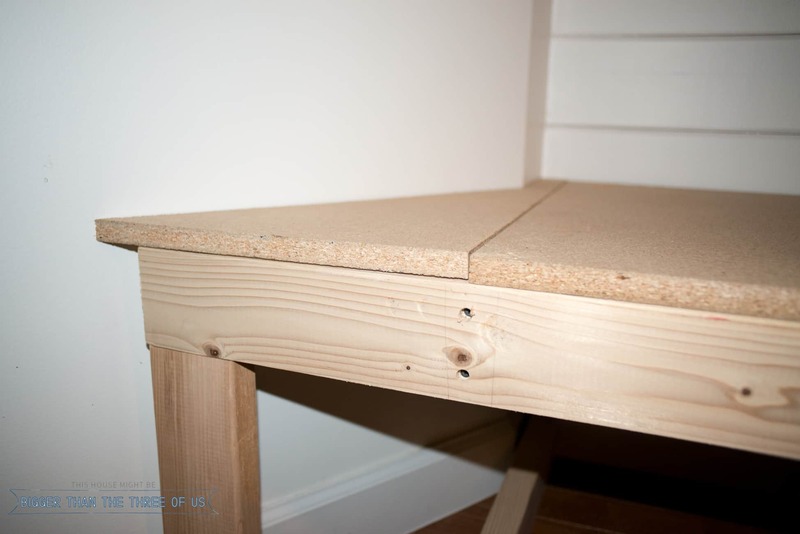 Fill any nail holes with nail filler, let dry, sand and paint. We choose to stop here but from here you could trim out the piece to make it more substantial. 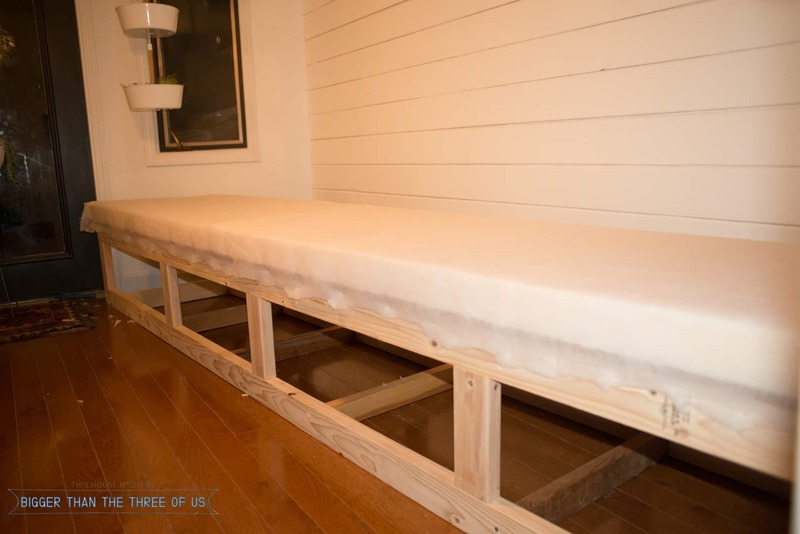 I really love how the DIY banquette turned out and it’s so functional. If I could change one thing, it might have been to go with a little better quality front/sides. When the sun is in full-force in our kitchen, you can see variations in the paint. But, really that’s being super picky. Otherwise, I really adore it. What’s your take? 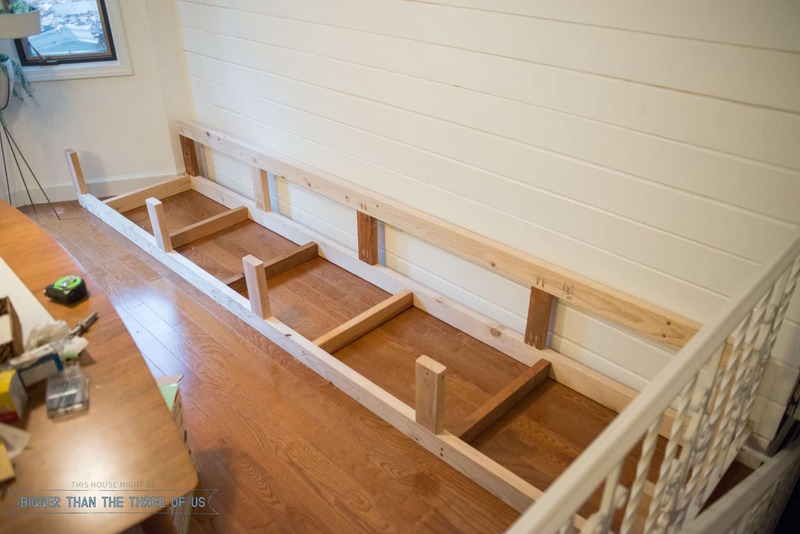 Would you do a bench seat in your kitchen? 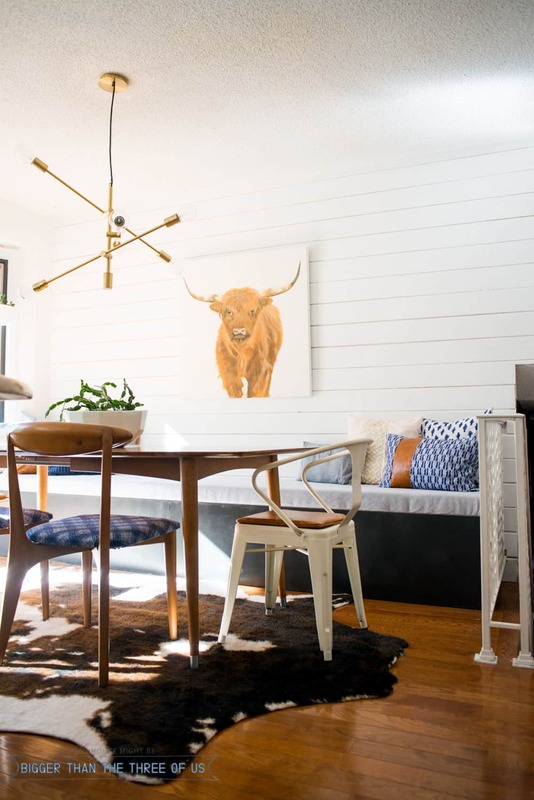 I’ve been debating doing something similar in our dining room. I live in fear of my son leaning his chair back and going right through the window that is mere inches from his chair. A built in banquette would be so much safer, and wouldn’t block the window to boot! Thanks for the great tutorial! You should go for them! I really love them. You might be having trouble when the screw is hitting the second 2×4. Sometimes, those can be a bit tricky. Did you try to get a pilot hole first? I tend to do best with that. Other than that, I’m not sure! This seems silly to mention, but if you are using a battery drill…make sure the battery is fully charged. I know, I fight the drill a lot when it’s battery is low. I think that would be amazing! I don’t think the rug would be too scratchy but all rugs are a bit different. My only hesitation would be if you planned on using the space as a lounge space. I think then, the rug texture might be annoying but for seating purposes only…. I could definitely see it! If you do it, email me or IG DM me a picture! I’d love to see!